An introductory ride to Wales. Never again will you fear the idea of 'cycling to another country!' For today you have stumbled across a very rewarding ride that will lead you across the River Severn into South Wales. 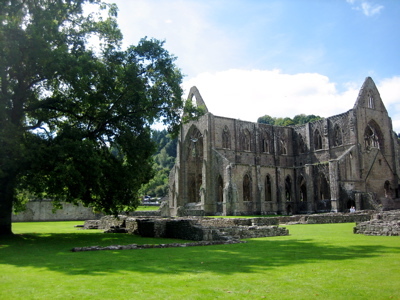 Tintern Abbey doesn't feature highly on the route. It turns out to be a crumbling old ruin, however it is roughly the furthest point of the ride and marks a huge psychological barrier: HALF WAY! True, this ride may seem pretty long for an introductory ride, but it's great for a warm day with a group of 2,3,4 or more. (Unadvisable for less strong riders to tackle solo). Follow this road all the way to Tockington (over motorway bridge. You can go left before it, but it's very easy to miss and it's only 500m or so shorter.) Turn left at T-junction in Tockington, pass straight through Olverton and continue all the way to the bridge (M48). Ensure you cross the bridge on the little road to the side. You're now in Wales! Take the A466 (can go on cycle path), up the gentle hill, over the roundabout and continue on A466 all the way to Tintern Abbey. When you reach the Abbey, there's a left hand turn slightly concealed (just before The Anchorman pub.) This road is single track and lumpy. At the T-junction turn left and left again at next junction (feels like you're doubling back). Not much more of the hill to go; don't worry! That's the hard part done. Now you'll coast back to A466 (downhill until you're out of Wales.) And the route back is just the reverse of the one there, making it quite simple for a decent length ride.